Sekotong in West Lombok is a beautiful stretch of white sandy beach coastline with a group of islands just off the coast referred to as the Southern Gili islands. Sekotong is the perfect destination for a beach holiday. It is easy to get to Sekotong, with direct flights into Lombok's International Airport. Sekotong is the place to come either if you want a relaxing holiday or action pack holiday with lots of island hopping, snorkeling and scuba diving. The Sekotong area is only around 1 hours drive from the Lombok International airport. There are around 15 islands that make up the Southern Gili Islands in West Lombok. Some of the islands that make up the southern Gili islands include Gili Gede, Gili Ringgit, Gili Layar, Gili Nanggu and Gili Asahan. Majority of the islands are unihabited with no accommodation. There are some hotels on Gili Gede, Gili Asahan and Gili Nanggu. Check the list of hotels at the bottom of this page. Gili Goleng, is one of the smallest southern Gili Islands, and the closest to the mainland. Although it does not have any accommodation to stay over night on the island, it does have several restaurants on the island where you can buy food and drink. Gili Goleng is a perfect island for day trips to. The water tempurate averages around 27 - 29 degrees celcius all year round making it perfect for swimming, snorkelling and scuba diving. Just a short thin wet suit is required for scuba diving. The scuba diving around the southern gili islands is some of the best diving in all of Indonesia. If you love under water macro photography then you will love to scuba diving here. You will find all the amazing small marine life living around the southern gili islands like a huge variety of nudibranchs, pygmy seahorses, harlequin shrimp. Some of the bigger types of marine life include moray eels, reef sharks, frog fish, lion fish, stingrays and turtles. At different times of the year, the gentle waters of Sekotong are visited by the amazing Manta Rays. There are more than 17 quality dive spots around the Sekotong area each with varying degrees of difficultlies. Many of these dive spots are perfect for beginner divers, with a few of the spots more than 18 meters which are only suitable for advance scuba divers. For advance divers, there is a dive site 1 hour drive from Sekotong, on the southern coast of Lombok called Belongas Bay. This dive site is famous for seeing Hamerhead Sharks. The current can be quite strong here. I can highly recommend the dive centre at Cocotino's. I stayed at Cocotino's for 5 days and did 4 days of diving and it was some of the best diving I have ever done. Very relaxing with so much to see. Odyssea Divers is PADI certified dive centre which is located within the Cocotino's Resort. Odyssea Divers can arrange scuba dive trips to any of the dive spots around Sekotong. Dive Zone arrange dive trips around the Sekotong area as well as to Belongas Bay in southern Lombok. At the most western coast of Sekotong Lombok is one of the best surfing spots on Lombok called Desert Point. The best times of the year to get the best surf conditions at Desert Point is from May through to October, though at other times of the year, don't leave your surf board at home! One of the closest hotels to Desert Point is the Desert Point Lodges. The Lodges are not right at Desert Point but only a short bike ride away. Not far from Desert Point is another great surf spot called Bangko Bangko. Sekotong is not that developed but there is still some quality beach resorts and hotels to stay in. There is a choice of beach resorts on the main land and a few hotels on the southern Gili islands. Cocotino's Sekotong is the best beach resort in Sekotong Lombok. A 4 star beach resort with luxury bungalows set in tropical gardens with it's own private beach front and a small swimming pool. Cocotino's has a scuba dive centre so you can get package deals that included accommodation, food and scuba dive trips. If you book directly with Cocotino's they provide a transfer from the airport to the resort. I stayed here for 5 nights and highly recommend Cocotino's! Silver Fern Beach Retreat is located on the Sekotong mainland of Lombok. The Suites Lombok is a luxury resort in the heart of Sekotong. One of the newest resorts in Sekotong with 11 suites and 3 villas. Coral Palms is one of the cheapest hotels in the Sekotong area with room rates starting from 350,000Rp per night (around A$35). Coral Palms accept credit cards for payment. Bola Bola Paradis is located between the green hills and the blue bay in Sekotong. Ko Ko Mo Resort is a luxury beach resort on Gili Gede. With a nice swimming pool, in house restaurant and plenty of water sport activities. Secret Island Resort on Gili Gede has a 2 bedroom villa on a hill and 7 double room units next to the beach front. Yut Inn Flower Paradise is a family run hotel resort on Gili Gede with nice wooden bungalows. Via Vacare Resort on Gili Gede is a quiet eco-resort has 4 double bungalows and basic dormitory accommodation. Lombok Marina Del Ray is a resort and marina. If you are sailing into Sekotong then you can moore your boat in the Marina Del Ray. 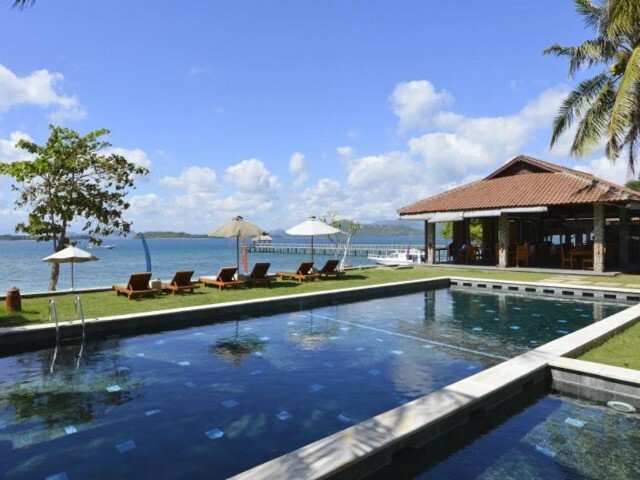 Pearl Beach Resort is a boutique hotel on Gili Asahan. With beach bungalows with queen sized beds. Gili Asahan Eco Lodge and Restaurant with private bungalows down near the beach front. Bungalow prices start from 1,500,000Rp per night (around A$150). 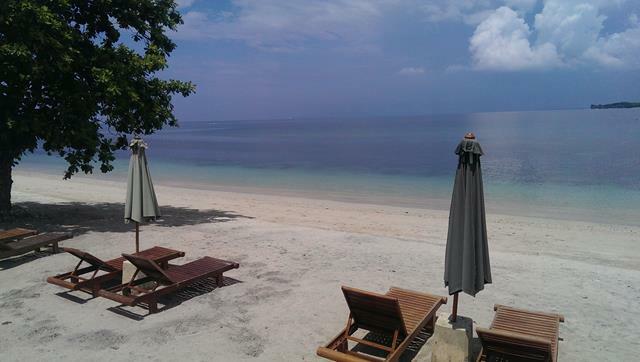 Layar Beach Bungalows, located on Gili Layar, one of the smallest of the southern Gili islands. With small wooden bungalows close to the beach front. The Sekotong area is around 1 hours drive from Lombok International Airport (LOP). The new Lombok International Airport was built in Praya which is located in the centre of Lombok. There are direct flights to Lombok from Kuala Lumpur Malaysia and Singapore as well as from Bali and Jakarta in Indonesia. Garuda Indonesia has direct flights to Lombok from Jakarta and Denpasar Bali and from Bima Sumbawa to Lombok and from Surabaya to Lombok and from Makasaar Sulawesi to Lombok. Lion Air has direct flights from Jakarta to Lombok (flight time 1 hour 55 minutes) and from Surabaya to Lombok (flight time 55 minutes) and Lion's budget airline Wings Air has direct from Denpasar Bali to Lombok (flight time 30 minutes). Batik Air have direct flights from Jakarta to Lombok (flight time 1 hour 55 minutes). Citilink Airline has direct flights from Surabaya to Lombok (flight time 1 hour 10 minutes). Singapore Airlines Silk Air has direct flights from Singapore to Lombok, flight time 2 hours 55 minutes. AirAsia has direct flights from Kuala Lumpur to Lombok (flight time 3 hours 10 minutes). If you are coming from Senggigi Beach then it will take around 1.5 hours to drive down to Sekotong. Or if you travel from Bali to Lombok by ferry, then the Lombok Lembar ferry port is only 15 minutes away from Sekotong. You can catch a ferry in Bali from Padangbai harbor. The ferry from Pandangbai Bali to Lembar Lombok takes around 4 - 5 hours. Ferries leave from Padangbari every hour and operate 24 hours a day. The price for the ferry ticket from Bali to Lombom costs 43,000Rp per person. There is food and drink kiosk available on the ferry.